The Safety and Health Protection on the Job in Vermont is a job safety law poster by the Vermont Department Of Labor. This is a mandatory posting for all employers in Vermont, and businesses who fail to comply may be subject to fines or sanctions. This poster must be posted in a conspicuous place by all employers so that all employees can see it. This poster describes the right that employees have to a safe workplace, how to request an inspection, how an employee can file a complaint against an employer for being discriminated against with respect to this law, and other rights employees have regarding health and safety. It appears you don't have a PDF plugin for this browser. 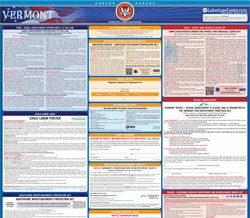 Please see the link below to download vermont-vosha-safety-poster.pdf. place hazards. You may ask VOSHA to keep your name conﬁ dential. there are unsafe and unhealthful conditions in your workplace. •  You or your representative may participate in the inspection. •  You have a right to see VOSHA citations issued to your employer. your exposure to toxic and harmful substances or conditions. •  Your employer must post this notice in your workplace. sor otherwise exercising their rights under the Code. visit OSHA’s website at www.osha.gov. Room E-340, Boston, MA, 02203, Telephone (617) 565-9860.
and health protection for workers. working conditions throughout the State. provided by non-enforcement Project WorkSAFE personnel.